Pozieres British Cemetery was started when a Dressing Station was established close to here in 1917. After the war the site was chosen to make a permanent cemetery and graves from the 1916 fighting for the village were moved in here. 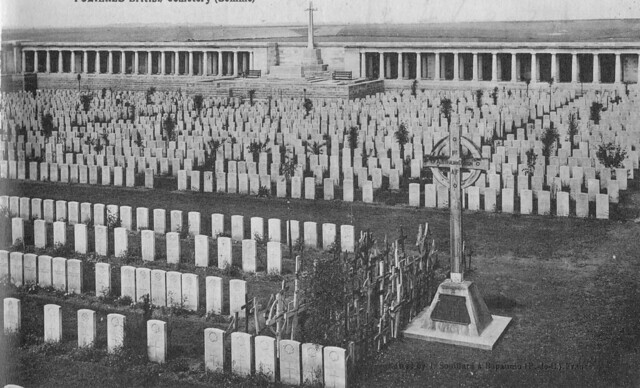 The Pozieres Memorial – the walls visible to the rear of the graves – was added later to commemorate those who fell in the March-April 1918 operations and had no known grave. This image dates from the 1930s and shows the completed cemetery but with some of the original features still in evidence. Of particular interest are the wooden crosses crowded into one area; these are the original grave markers and there was no-one buried under them at this stage; headstones had already replaced them. Families visiting the battlefields at this time could claim original crosses and even apply for them by post. The larger cross was a memorial to the 1st Australian Division which had been unveiled here on 8th July 1917. The Division had suffered over 7,700 casualties in the Pozieres fighting. The cross was later replaced with a permanent memorial and was taken back to Australia. This entry was posted on 02/03/2012 by sommecourt. It was filed under Battlefields, France, Great War, War Cemetery, War Memorial, Western Front, WW1 and was tagged with 1916, 1918, Memorial, Picardy, Pozieres, Somme, War Cemetery.